Great vacation for 10 days Egypt tour to explore the majestic Egypt tourist attractions. Visit the famous monuments in Cairo the capital of Egypt such as the Pyramids, Coptic and Islamic landmarks. Enjoy deluxe Nile cruise between Luxor and Aswan. Discover the natural and the beauty in the best resorts of Egypt, Hurghada. Our 10 days Egypt tour it’s all about the adventure and recreational in one trip. Book us Now! The service meets and assist at all your destinations. 3 Nights accommodation at 5* deluxe Nile cruise based on Full board. 2 Nights accommodation in Hurghada at 5* hotel based on All Inclusive. All your tours and excursions are by private A.C. Cars. An expert Egyptologist guide all your tours. Upon arrival to Cairo airport, “Egypt Tours Portal” representative will assist you through passport control formalities, luggage identification & portage will greet you. From the airport, you will be transferred by a private A/C car to your hotel for check-in. At the end of the day, transfer to check in you 5* deluxe Nile cruise and overnight on board. A temple overlooking the Nile. Kom Ombo temple is divided into 2 temples with 2 entrances, 2 hypostyle Halls, and 2 sanctuaries. Back to cruise and overnight on board. Enjoy the breakfast on the cruise, then join our tour guide to visit Edfu temple. The final resting place of Egypt’s rulers from the 18th to the 20th dynasty, Valley of the Kings is home to tombs including the great pharaoh Ramses II and boy Tutankhamen. The tombs were well stocked with all the material goods a ruler might need in the next world. Most of the decorations inside the tombs still well preserved. Hatshepsut is one of the most beautiful & best preserved of all of the temples of Ancient Egypt. The temple was built on three levels with two wide ramps in a central position joining the levels together. In the day 7 of your 10 days Egypt tour, check out from the hotel, then transfer to Hurghada for overnight at 5* hotel to enjoy the third part of your journey, it recreational days in Hurghada Red Sea. Have your breakfast, then enjoy snorkeling excursion, Overnight in Hurghada. It was constructed between 1830 and 1848, the mosque named “The Alabaster Mosque” because most of the walls made out of pure alabaster. Mohamed Ali Mosque is a replica of the Blue Mosque in Istanbul. At the end of the day, we will transfer you to your hotel in Cairo and overnight. Breakfast at the hotel our representative will transfer you to the airport and assist you at the airport through final departure formalities to finish your 10 days Egypt tour. Visited Egypt for 10 days and 9 nights. tour outsourced to Egypt Tours Portal. Had a Memorable and glitch free trip thanks to the professional approach of the tour operator(Ahmad Sameer) and his team . Prompt response and ease of booking(Only 100 dollar advance for a family of five on a ten day trip is unbelievable). Value for money and competitive prices. Regular advise and follow up till day of journey. Hassle free reception and convenient comfortable accommodation during entire trip. Provision of pleasant, competent , knowledgeable and English speaking guides. Interactive approach with flexibility to alters days program. The following guides who were with us and were well equipped to give you an insight into the great Egyptian Mythology are also strongly recommended. They made us feel at home and attended to all our concerns promptly. Ahmad- On Nile cruise from Aswan /Luxor. Finally Sameer keep up the good job and shukran to you and your team for giving me and my family an experience of our lifetime. Professional and expert guides made our Trip to Egypt the most memorable trip ever. Our guides Ahmad and Mohamed gave us a slice of Egyptian history and culture with great professionalism. 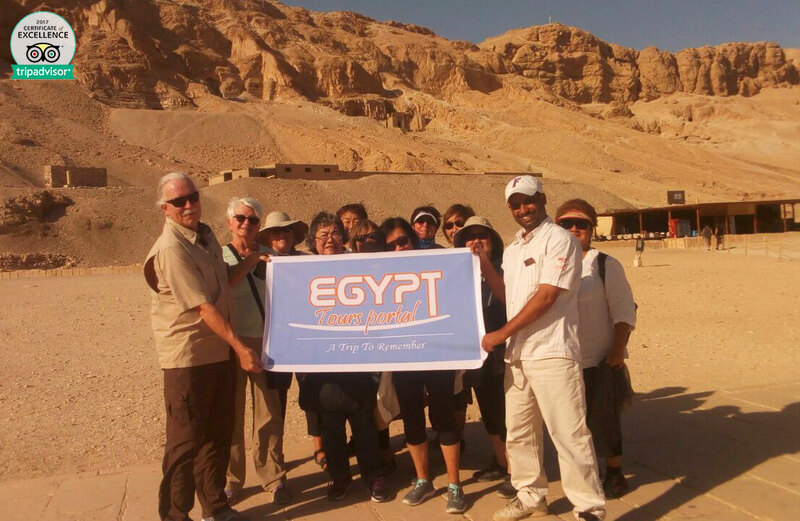 We have just returned from an amazing 10 day tour of Egypt – thanks to Egypt Tours Portal! (ETP). Like all travellers we had some concerns travelling to Egypt in the current climate of unrest in nearby countries – particularly as we were taking our two children (boys aged 7 and 9) with us. We need not have been worried, Mr Ahmed Sameer from ETP organised every aspect of our 10 day tour (and even when our flight to Egypt was delayed a day) nothing was too much trouble for Ahmed who reworked our itinerary to suit. We were greeted at the airport as promised by Terak who took care of organising the visas and getting us to our driver (who the kids called Alah din!) and checked in to the hotel. All very professional. Our delightful tour guide in and around Cairo (Eman) was fantastic (university educated) and extremely knowledgeable on all things Egyptian! The kids had a great time and she answered all their many and varied questions and organised to keep them entertained! All ETP guides are qualified Egyptologists and are fantastic. Our tour included a cruise down the Nile (great crew on the Solaris!) and again we had another fantastic guide Eid, who showed us all the sights in the Aswan, Kom Ombo, Edfu and Luxor areas. We were driven to Hurghada on the Red Sea (yes ETP has or hires excellent vehicles) where snorkelling was organised and the accommodation was 5star. The package is great in that it includes all transfer fees, internal flights, entrance fees, accommodation, breakfast, lunch and even most dinners. Water is supplied in the vehicles, and there are plenty of stops at various intermediary places to check out. We took advantage of a few ‘extra’ tours (we will probably only be here the once so made an effort to see as much as possible) but you do not need to if you don’t want to. I note that ETP does tours from less than a day through to multi-week. Just let them know how long you will be there and what you want to see and they will put it together! I don’t think you would get the full ‘Egyptian experience’ if you went for less than a week. Everything in Egypt runs on tips – just how it is – and while the tips are not included in the package, the guides are happy to provide advice on what is expected. Then it is up to you as to how much you tip. Hawkers, vendors are everywhere and are particularly ‘in your face’ around the tourist areas. We found the bazaar in downtown Cairo much better for shopping with the shopkeepers all very nice and with some excellent wares. We were extremely pleased to have found such a great tour company who really do look after you – there is no way we could have organised the stay as well if we had done it independently. A big thankyou to Ahmed Sameer and Egypt Tours Portal for making our trip to Egypt a wonderful travel experience. Thankyou also to the drivers (Alah din and Mohammed) and the best tour guides Eman and Eid. Egypt needs tourism to survive and it is currently at quite a low, this means that the authorities are keen to ensure that everyone is safe. We had a fantastic time and reckon you should book now – before the weather warms up too much!